It all started on Twitter. Doesn’t a lot of stuff nowadays? I started following this restaurant on Twitter – Chris’ Cosmic Kitchen. The owner’s wife Kris was the social media person for this account, and on mine and Peter’s 11th anniversary, we decided to eat brunch there before heading to the beach. Two months later in September, yet another Twitter friend, Sarah, tweeted that she was setting up a challenge for herself. She’d just come off a relationship and wanted to learn more about herself while at the same time avoiding falling into yet another relationship. Her project was called “52 Squires,” and her goal was to go on 52 first dates in a year. The guys had to be willing to go on the dates, and she was only doing it by referral. In other words, if a friend recommended a guy, then she’d go out with him. She wasn’t going to go pick up guys at bars or clubs, or even do the online thing. We messaged a bit, then started emailing, and I recommended Craig to her. In the midst of this emailing that started off with me talking Craig up to her (while at the same time nudging him in her direction), we started talking more and more about ourselves. We met about a week later. I wrote about it here. I never expected to make a friend almost instantly, but it happened. After walking the labyrinth, we talked over coffee for at least two hours. Sarah has connections that I don’t have, and I have connections she doesn’t have. We promote each other’s businesses and inform each other of business opportunities. Crises? We’re each other’s go-to friend. Need re-energizing? We meet for coffee and get recharged off each other. Need quiet time? We find that together, too. I see in Sarah that same, “There’s no such thing as failure” attitude my daughter has regarding her business, and it helps me keep perspective. I value her for who she is and all that she brings to our friendship. I am a more relaxed person and a better business woman because of her. Who in your life gives you perspective, re-energizes you and helps you be the best business person you can be? Last week was crazy here, dear readers, which is why I’m so far behind on the weekly blog post. My weeks lately (in addition to the typical homeschooling) have included running some test batches of soap for Nature’s Garden, potty training and putting together a large order for Duplin Winery. It’s almost Autumn. I was thinking earlier today how it is that so many of my fellow Indies have time to keep it current on Facebook, Twitter and the Indie Beauty Social Network. In fact, I’m feeling left behind, because I barely have time to read posts, let alone post a whole lot. Then it dawned on me. IT’S FALL! That means… SILLY SEASON!!! And, absolutely, the silly season is upon me. My stockists want their Holiday merchandise and I have my own shows for which to prepare. I have several random thoughts to toss out there for this week’s blog post. I apologize if they don’t seem very cohesive. 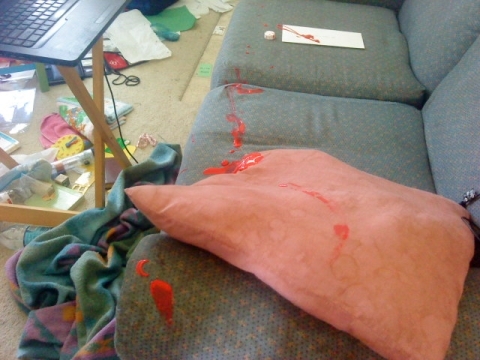 First there was the bottle of Christmas red acrylic paint that my toddler spilled all over the living room. My living room looked like a crime scene. No kidding! One of my friends said that the chalk outline was the only thing missing. Really, Officer, it’s NOT blood! The soaps I’ve been making to test the Nature’s Garden fragrances will be offered for a limited time. If certain soaps go really well, then I’ll introduce them to my regular inventory. There will only be 2-3 bars of each soap available, so quantities will be limited and likely to go fast. There are some delicious fragrances in the bunch, but I think the most fascinating one I’ll be calling “Fizzy”; it smells exactly like Dr. Pepper. I could even smell the carbonation bite. I made this one with French green clay. There are also two new beer soaps – one for men, one for women – on the rack, as well as several others. Orange Chiffon Cake Soap Cupcakes – Smell divine! Two shops here in Burgaw will be carrying my soaps by the end of September. The Nifty Place will be selling a selection of all-natural soaps, as well as Sub-Lime Sandalwood beer soap (just for something for the fellas). Courthouse Coffee will be selling the following soaps: Green Tea, Coffee Mocha, Goat’s Milk & Coffee and Fresh-Brewed Coffee. I’m honored and privileged to be working with these two awesome small businesses! Fresh-Brewed Coffee Soap – What a wake-up call! I don’t like loud dogs early in the morning. I mean, does anyone, really? Yet we have these neighbors who let their dog out every morning at 7:00, and this dog barks at anything and everything. Of course, he often wakes my baby, too – sometimes before she has the first interest in waking up. I know that’s random; just tossing it out there. In addition to last week’s potty training, soap-wrapping, soapmaking and homeschooling mega-bonanza, I found out from one of my lovely Facebook fans that my site had been hacked. I’m not talking the rather diminutive hack of two years ago where someone embedded a (bad) link for cheap ED drugs out of Mexico. Nooooo… This was a full-out hack job that took over my entire site – in both English and Arabic and with music (in English). It was ugly. And just in case I didn’t fully catch that my site had been hacked, under the red and black image of the grim reaper was the word “hacked,” just to make sure I was fully aware. So, here I am on Friday evening, texting my web guy who was in England working with an asphalt crew on the side of the road late that night (that’s a five hour time difference), posting to the Zen Cart forums and initiating a chat with my host’s tech support folks. Donal texts back that he’d be done in two hours (gotta love that kind of dedication! ), but in the meantime, the tech support guy at Hostmonster and I explore the hack. One of the dates of the script changes was 9/11/11. The significance of that wasn’t lost on me, and it made me slightly sick. In the end, though, the tech support guy got me debugged and unhacked in half an hour or so. I could see where all the bad files were; I know my cpanel that well (that came up as my website on one of the hacked changes). I’ll stop blathering now. Some of my friends and I are talking food! Yum! Feel free to post comments. They don’t have to apply to anything in particular since I was pretty all over the board on this week’s post. Image via WikipediaPresident Franklin D. Roosevelt proclaimed 7 December 1941 as “a day which will live in infamy.” It’s on the calendars – if you get the right calendar – as “Pearl Harbor Remembrance Day.” Seventy years after the fact, and we still remember when the Japanese bombed Pearl Harbor. We tell our children of what happened on that fateful day and what consequences it had for us as a country. There’s another day that will live in infamy – 11 September 2001. It was on this day that terrorists hijacked four airplanes and crashed them into the twin towers of the World Trade Center in New York City, the Pentagon and a field in Pennsylvania. That last plane – United flight 93 – was meant for the U.S. Capitol Building. However, brave, terrified passengers fought back and gave their lives to save unknown hundreds. This is true heroism. Thousands were killed on 9/11, and hundreds of others remain unidentified. The president of the United States wants to make the tenth anniversary of this tragedy a day of service, asserting that we should move forward, that remembering 9/11 is “clinging to the past.” Now I have nothing against serving others, whether in my own community or in other parts of the world. In fact, I believe service should be a regular part of our lives. I do, however, have something against trying to block these events out of our minds. Let’s review what happened. Extremist Muslims (those who are dangerously faithful to their faith) hijacked planes in our country filled with innocent people and used those planes to essentially fire bomb buildings where there were thousands of other innocent people. These people were children. Mothers. Fathers. Grandparents. Sons. Daughters. Friends. Beloved aunts and spoiling uncles. Think for a moment of all the people who love you, those who would be sad if you died suddenly. Now multiply that number by about 3,000. That’s how many lives were indelibly changed that day. This doesn’t include the bystanders and the rescue workers. Nor does this include you or me. Pentagon Building, Washington D.C. ~ The space circled in white is where a friend’s office was. He was called out to a last-minute meeting earlier in the morning. Do you remember what it was like to fly before 9/11? Do you remember going into government buildings or hospitals without having to pass through metal detectors? Do you remember not having to have your bags searched when you went to concerts, theme parks or sporting events? I do, but that memory is getting distant and faint. ALWAYS remember. NEVER forget. 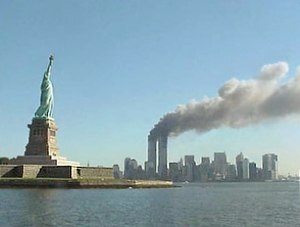 Don’t dishonor those who died for another group’s jihad by NOT remembering the events of September 11th, ten years ago. Serve others every day; remember these Americans at least once a year.